The roster of the living former Brooklyn Dodgers is now one player lighter. Boyd Bartley, former shortstop for the Brooklyn Dodgers passed away Friday evening in Hurst, Texas. He was 92. The Dodgers signed Bartley from the University of Illinois in 1943 after a bonus steered him away from his hometown Chicago Cubs. The young shortstop was heralded for his defensive prowess, receiving comparisons to Lou Boudreau. The Dodgers wasted little time in testing Bartley’s skills, inserting him into the lineup a day after he signed, starting both games of a doubleheader against the Cincinnati Reds. Sadly, Bartley never lived up to the comparison to the future Hall of Famer. Bartley made three errors in his first three games, shaking manager Leo Durocher's confidence. He lasted nine games in a week-and-a-half, batting 1-21, with his only hit coming ironically against the Chicago Cubs. The club sent Bartley down to Montreal due to his lack of production, as the 37-year-old Durocher inserted himself into the shortstop role. 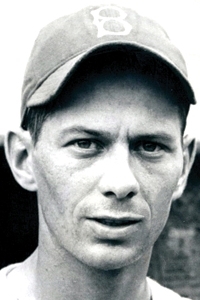 Bartley played in Montreal for about a month before being ordered to report to Camp Grant, Illinois on July 12, 1943. Like many of his era, his World War II service greatly affected his baseball career path. While serving with the Army in the Pacific, Bartley was operating a jeep when he encountered a Japanese patrol. In his attempt to escape the patrol, his vehicle flipped over and he injured his shoulder. His arm never fully recovered. He returned to baseball in 1947, and spent a few more years as a player-manager in the Brooklyn Dodger system with the Ponca City (Oklahoma) Dodgers of the Class D KOM League, guiding them to two division titles between 1947 and 1952. He missed the 1951 season as he was recalled to active duty, serving as an athletic director in Fort Chafee, Arkansas. When the KOM league folded after the 1952 season, Bartley managed an additional four seasons for their various Class D affiliates. Bartley's death leaves only 42 living players who donned the Dodgers uniform in Brooklyn. He is survived by his wife Aletha, to whom he was married for 69 years, as well as his three sons, his daughter, and numerous grandchildren. Editor's Note - Bartley's place of death has been corrected to Hurst, Texas, as per the Ponca City News.